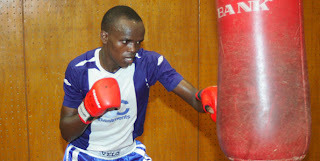 Kenya’s only male boxer at the Olympics, Benson Gicharu Nganjiru was knocked out of the London Games by Egypt’s Abdelaal Hesham on Monday’s bout. The ‘Chafua Chafua’ boxer lost the fight 16 – 18 to the fellow African, recording scores of 6-6, 5-8, 5-5 in their round of 32 bout. Gicharu was Kenya’s hope in rekindling memories of the late RobertNapunyi Wangila, who knocked out Frenchman Laurent Boudouani to claim the welterweight gold in the 1988 Summer Olympics, in Seoul. Kenya’s hope for a boxing medal now lies on female boxer Elizabeth Andiego.